Ironing is a weekly chore for me. I don’t mind it much, and it saves a bit on monthly expenses. I’d much rather spend those extra dollars on fun stuff for crafting or for the house. The ironing board and I have a date which usually falls on a Sunday. My ironing board and I have been friends for many, many years and it was had gotten a bit wonky, in that the legs were stiff and I could not close it up anymore. 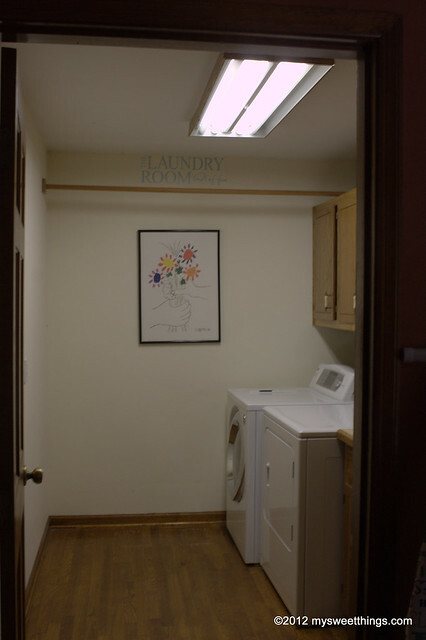 Having it down all the time took up some valuable space in the laundry room. It was time to retire my ironing partner, so I headed to Walmart in search of a replacement. 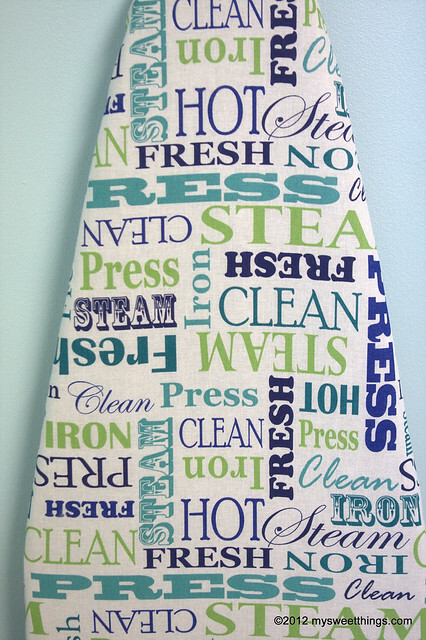 I found an ironing board with a cute pattern and the color’s were fun, and bright. If I have to spend time ironing, I might as well enjoy the view! White, blues, and greens. Light and crisp! I took a good look around my laundry room and decided that this new lovely piece needed a new space. 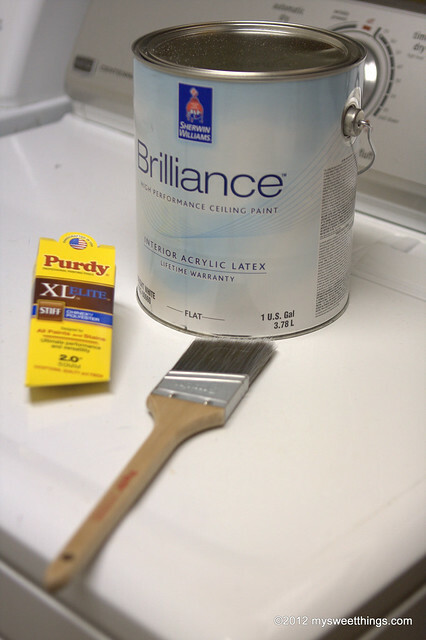 A laundry room makeover was going to happen. When I moved into the house, this room was pink. Pepto-Bismol pink. Really! I wish I had a photo from way back then. It stayed that way for a few years and then I could not take the pink so I had white and green paint from other projects and I painted over the pink and left it at that. While the overhead light is bright, it is also not attractive. It reminds me of office lighting and the cover to it has been long gone. All the cabinets are oak and while I loved it 12 years ago when I bought the house, I am not a fan anymore. 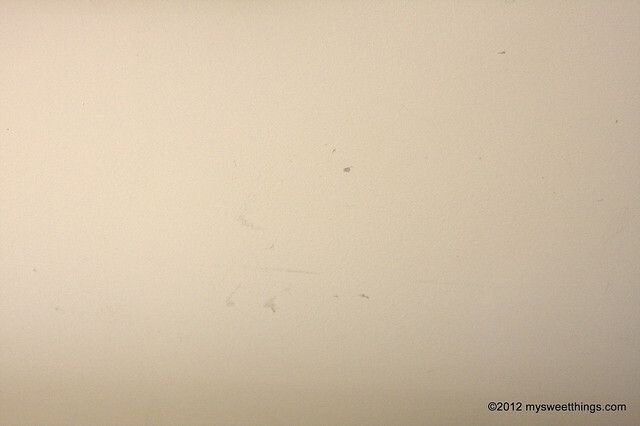 The ceilings were dingy and had marks on them. I am not sure how those marks got up there but they need a touch up for sure! 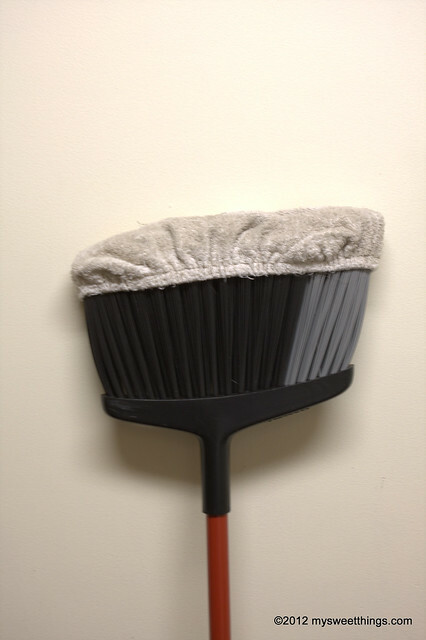 This broom and mop cover helped sweep off the few cobwebs in the corner and other little dust bunnies that were hanging out on the ceiling. The first step of this makeover was the ceiling. 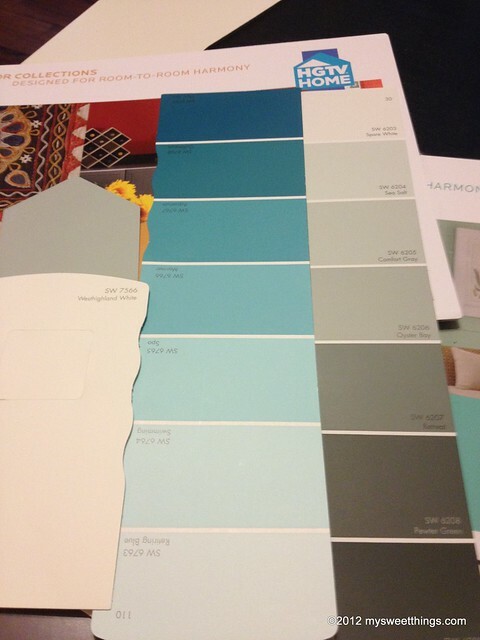 I stopped by my local Sherwin Williams store and picked up ceiling paint and paint samples for the wall color. So I have no photos of me painting the ceiling but you aren’t missing much there. Painting ceilings is a pain. Literally in your back and neck, but the results are amazing. Bright white which again I have no photo yet, but that’s coming up in the reveal post! After the ceiling, I turned to the base boards. Goodbye oak stain trim! Hello white! Painting trim is a bit time consuming. It took two coats of primer and two coats of white trim paint to cover the glossy, oak trim. Thanks to FrogTape for including a roll in my Haven Swag Bag. 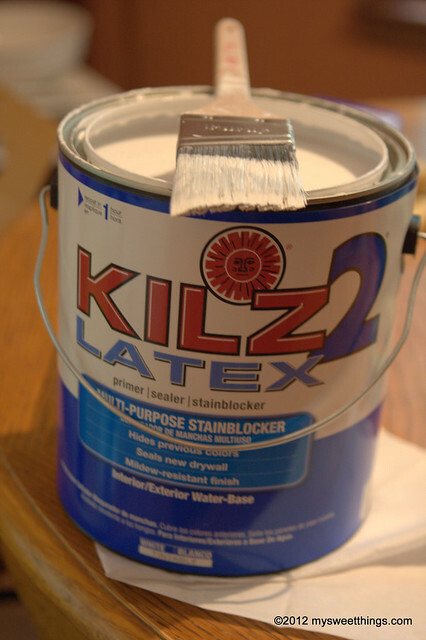 It came in handy to protect the wood floors from any paint mishaps! So the ceiling is done, the trim is painted and next up was the wall paint. I choose Sherwin Williams Swimming. This paint is from their HGTV Home Collection. I used a foam roller for the walls and cut in the corners, top and bottom of the walls with a Purdy paint brush that was included in my Haven Swag Bag! Gotta love all the swag that was useful for this project. 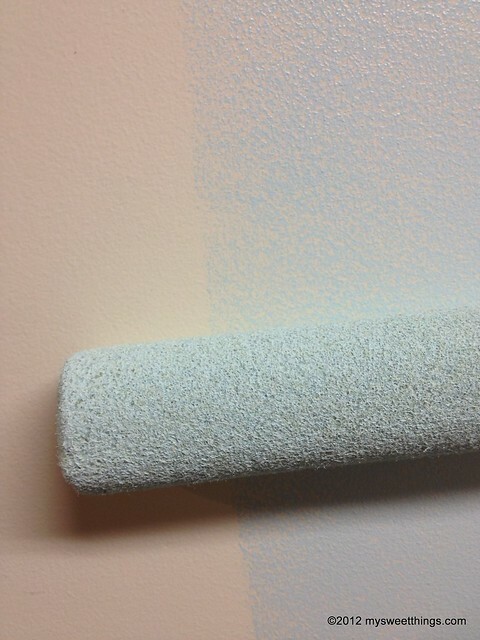 This iPhone shot shows the before and after color. I applied two coats of swimming and I can say the wall color is complete! Ceiling check! Trim check! Walls check! 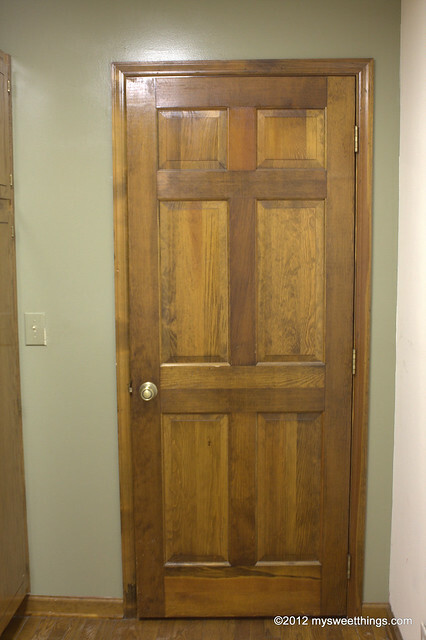 It’s time for that oak door! I saved this for last since I thought it would be a pain but it really wasn’t. I removed the door from the frame and I applied two coats of Kilz2 Latex primer yesterday. 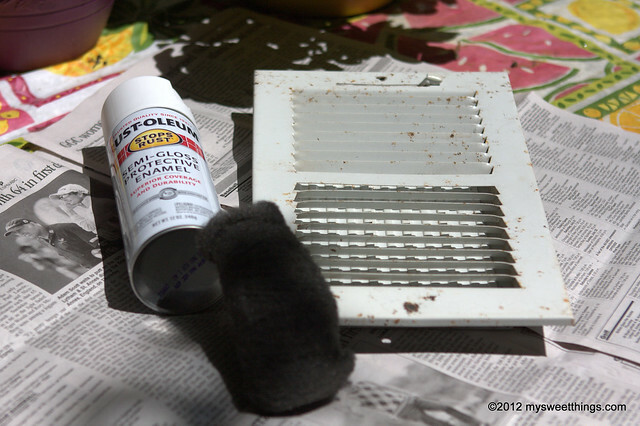 There is no odor to this primer so I was able to quickly get the job done inside the kitchen. 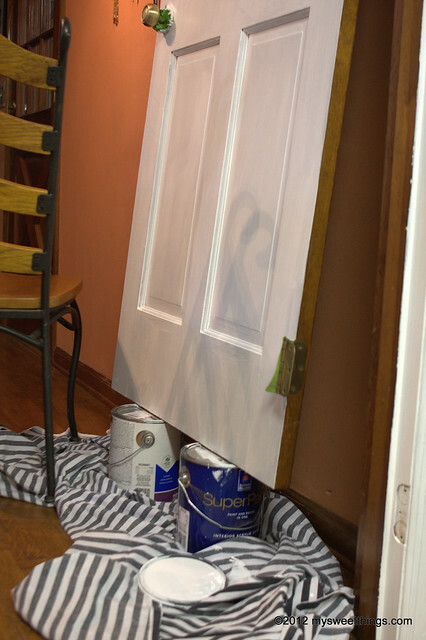 Two paint cans were a big help in lifting the door up off the floor so I could get way down low with no problem. This nasty vent is behind the door and it was a hot mess. I wiped it down with steel wool and then applied a coat of Rust-Oleum semi gloss protective enamel in white. It freshened it right up! No after picture yet but it is true white now! So that is where I am at for now. I need to finish the door today and I’m looking for a small rug to draw some color down to the floor. I’ve had no luck in finding one yet but I think a trip to Home Goods will take care of that. I have a few pretty touches to add and yes it is a laundry room but it does deserve some pretty! Have you been inspired by a small purchase that has caused a detour to start a project you did not have on your list? It’s going to turn out really great! Nice to find someone else who doesn’t mind ironing! 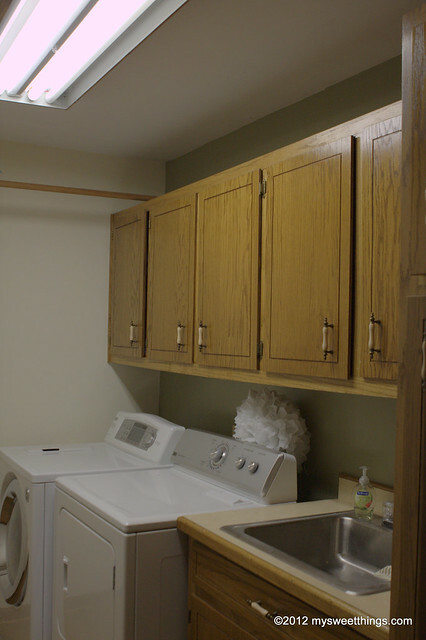 My laundry room is on my list but right now I’m just gathering ideas so your pictures will be pinned to my “Laundry Room” pinterest board! Thanks for sharing. Can’t wait to see what you find at HomeGoods. How much do you LOVE that place???? Love your inspiration piece! I can’t wait to see the final room. The room is coming together..slowly! I do love the inspiration piece and Wendy, I can’t wait to see the final room myself! I have some more work to do! that ironing board cover is awesome, the colors are perfect. that space is going to be beautiful!! Looks like the room is really coming together! 🙂 That ironing board is pretty awesome too, you’ve got a good eye!